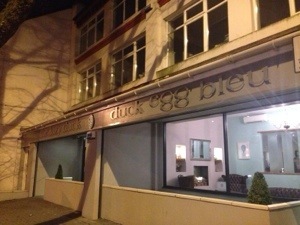 The opening of Duck Egg Bleu, which happened in December 2013 after a few delays, was eagerly anticipated amongst the foodie community. Cardiff born chef, Gareth Dobbs, made no secret of his ambitions for the restaurant to become recognised by Michelin – and with a CV that includes spells at Le Gavroche and Petrus, his goals certainly don’t seem unachievable. I was keen to try Duck Egg Bleu. Its website and all of its launch marketing have consistently made a big play of the fact it’s a “Fine Dining Restaurant” – fine dining being something which I love, and something which is hard – if not impossible – to find in Cardiff. So, we booked a table for a Saturday night (I discovered when they answered the phone that it is in fact pronounced ‘blue’ and not ‘bleu’!) and headed to its location on Cowbridge Road East. From the outside, the place, with its sister venue The Lazy Duck next door, looks impressive and classy. We decided to have a drink in The Lazy Duck (a relaxed, wine bar type effort) beforehand, which was very pleasant, although they didn’t have a cocktail list (they’re working on it) and the wine list was very limited – but the place had a nice buzz without being too crowded or hectic, so it was a pleasant venue for a pre-dinner drink. At the appointed time, we went next door to Duck Egg Bleu, where, unfortunately, our evening got off to a rather bizarre start. We’d booked for 8.30 and were bang on time, but when we checked in, we were told “There’s going to be a bit of a wait”. We were then told “But I’ll take you to your table.” Confusion reigned – but we managed to ascertain that there would be a wait for our food. The restaurant was busy, but not full, so we were surprised to be taken to a side room, which already contained two large tables of about 10 people each, both of which seemed like parties in full swing – plus two small tables for two shoehorned in between them. I immediately said we didn’t want to sit there – there’s nothing worse than trying to have a quiet meal for two whilst surrounded by large groups – so asked if we could sit in the main restaurant, where there seemed to be numerous tables free. The waiter said he’d need to go and ask someone, so we followed him back out into the main restaurant, rather than standing awkwardly between the two party tables! He eventually gesticulated at a table for two, not laid up, which he said he’d lay up for us, but there would be a wait so did we want to go back into the bar for a drink (not really). There were several other tables for two already laid, so I asked if we could have one of those, and yes we could. Oddly, after we were seated, no other new diners arrived at the restaurant, so I have absolutely no idea why we were initially given such an awful table, and why there was such a palaver about getting us a new one – but we got there in the end. Again, once we were seated, the waiter reiterated that there would be a wait for the food, as there were 3 or 4 tables due to order before us. Thankfully, we weren’t in a rush, but we probably could have lived without knowing their operational details! Phew! Thankfully, the menu looked good. A good a la carte selection, plus a grill menu (predominantly steaks) and the option of having a five course meal, selected from the a la carte, with amuse bouche and pre-dessert for £32.50 plus supplements for some of the dishes. We decided to do this as it seemed like excellent value. The wine list was also pretty good. As it happened, we didn’t feel we’d experienced much of a wait to order, or indeed receive, our food, so the earlier comments about a bit of a wait, others ordering before us etc. made an issue out of something that wasn’t one. 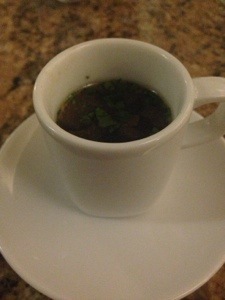 Our amuse bouche was an Asian infused beef tea, served in an espresso cup. This was tasty – Mr W was less keen than I, but he’s not a big fan of Asian flavours. 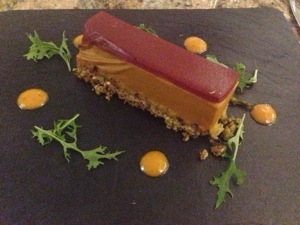 To start, I chose a lobster cheesecake with a red pepper coulis, pistachio base and a tomato jelly. This was an excellent dish, beautifully presented, and served warm – which I wasn’t expecting, but which brought out the rich, smooth lobster flavour. The tomato and red pepper complemented it beautifully, and the base was just crunchy enough to give the dish some depth, without making it hard work. Mr W chose the eponymous “Duck Egg Bleu” – ham, peas, egg and chips – which was actually a terrine of braised pigs cheeks, a pea mousse, poached egg and pain perdu in the shape of chunky chips. He really enjoyed this – and it was full of flavour – but for me it was slightly odd in that all of the dish was warm, apart from the pigs cheeks which were refrigerator cold. 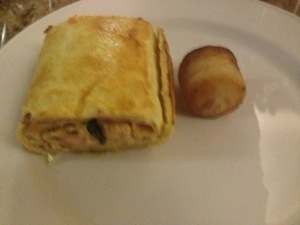 My main course was a salmon wellington, served with leeks, fondant potato and a watercress sauce on the side. This was a gigantic portion of food – I literally only ate half of the wellington and felt like I was going to burst. 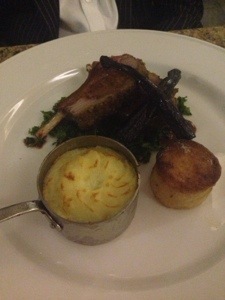 It completely hid the bed of leeks and overshadowed the fondant potato, so it looked fairly ridiculous on the plate. The flaked salmon filling was tasty, well seasoned, with finely chopped veg mixed in (although I’d been expecting a whole fillet of salmon. Unfortunately, the puff pastry was slightly undercooked. The sauce was lovely, with a real depth of flavour, but there was nowhere near enough to go with the giant wellington. Mr W chose a parsley crusted rack of lamb, which was excellent, cooked pink, and served with a shepherd’s pie (or ‘shepard’s, if the menu was to be believed!) of shoulder, cabbage, heritage carrots and a fondant potato, plus a redcurrant and rosemary jus. The shepherd’s pie was particularly tasty and a great idea for a twist on a potato accompaniment, but it was totally unnecessary to have both this and a fondant potato on the plate. 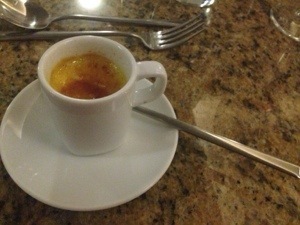 Pre-dessert came in the same espresso cups as the amuse bouche, and was a very good crème brulee. 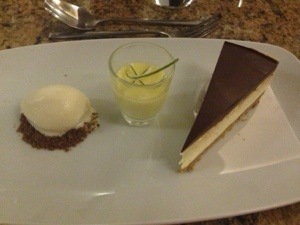 Main dessert, for me, was lime cheesecake (two cheesecakes in one night! 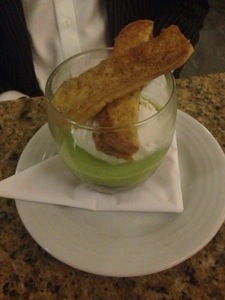 ), which came with chocolate ‘gnache’ (sic), lime posset, bitter chocolate sorbet and candied lime. This was a real mixed bag: everything on the plate was good, but – again – there was too much, and it didn’t really go together. The cheesecake base was excellent, as was the lime topping, which was light, creamy and delicately flavourted – but this was completely overpowered by the rich chocolate ganache topping. The lime posset, on the other hand, was eye-wateringly sharp – and could have really benefited from being paired with something more strongly flavoured (unfortunately I didn’t get to eat all of it as the spoon supplied was too big to fit into the shot glass in which it was served). The candied lime was lovely, though. The sorbet didn’t taste of much at all – and I’m not sure if it was bitter chocolate flavour (it certainly wasn’t bitter chocolate colour!) and probably had no business being on the plate. 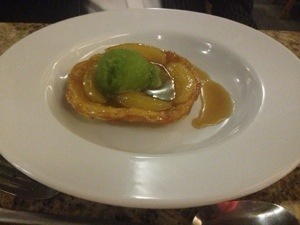 Mr W finished off with an apple tarte tatin, served with a green apple sorbet and cinnamon crème anglaise. The tarte was fantastic, with a rich, caramel flavour. The sorbet and crème were good too – but didn’t really work together, and should have been an either or, not a both. Despite all of the issues I’ve picked up, we did enjoy our meal – but it wasn’t, by any stretch of the imagination, fine dining, but rather brasserie style, or even gastropub style cuisine, with hearty dishes and hefty portions. Likewise, the service, although well-meaning, polite and friendly, was not fine dining style – the staff all seemed relatively inexperienced (although keen to please, and keen to append ‘Sir’ and ‘Madam/Madame’ on the end of everything they said to us!) and there didn’t seem to be a confident maître d’ running the show. On the plus side, there was a nice atmosphere in the restaurant (once we left the side room!) and the décor is clean and fresh. If Duck Egg Bleu positioned itself as a contemporary bistro or brasserie, it would be almost there in getting it spot on, and it’s certainly a welcome addition to Cardiff’s dining scene. But for Michelin level fine dining, it’s got a long way to go. Thank you for your comment. I am guessing that perhaps you are from Duck Egg Bleu, due to the mention of TripAdvisor where I now note there have been some similar comments made. To respond to your points, Mr W and I have both eaten in a lot of Michelin starred restaurants (some of which are reviewed on the blog), including, as it happens, Le Gavroche and Petrus, plus a lot of other fine dining restaurants. I know you will probably think that is pretentious, but I’m just trying to illustrate the fact that we do “got an idea” (sic) about “Michelin dinning” (sic). Re freebies, I always state in my reviews if a meal has been complementary so you should be able to see that I’ve raved about all sorts of places where I’ve been a paying guest, and conversely been far less positive about some where the meal has been complementary. Finally, there are actually a lot of positive points in the review, not least the fact we gave the food 4 stars out of a possible 5, so it’s a shame to focus on the negatives. I thought this was a good review and largely positive, so the early hours post from x-men was a tad unnecessary. But the poor spelling gives an indication on the intellect here! So no need to say any more. Thanks for your comment, Ange. I agree! I hadn’t noticed the early hours time stamp on X-men’s comment, but you’re right! I think this sounds like a fair, overall positive review. Living in Swansea I agree it’s almost impossible to find fine dining restaurants close to home so I love this review as it’s something I lookout for. Certainly wouldn’t put me off going and it does look like good value! Will definitely consider making a trip to eat here based on your review (I hadn’t heard of this restaurant otherwise). And totally get where you’re coming from with regards to service, after working for a respectable catering company in Cardiff whilst at Uni & eating out, you can definitely spot the difference between fully trained staff. Nice to hear they are keen to please though, as I think that makes all the difference. Thanks for the comment. Yes, there were lots of positives! Had they not over promised with proclamations of fine dining, it would have been even more so. I can asure you that this post wasn’t from duck egg bleu, you can chose to believe that or not. But why would I be nice in a private message to you then type that! Thanks for your comment, Gareth. I don’t know why you (or perhaps someone else from your team?) would have posted that comment late at night. I guess maybe I thought you may have been miffed that I politely declined your request to come back in and talk about my views. But as you’ve said it wasn’t you, I apologise for thinking that it was. I’m just unsure why anyone who didn’t work at the restaurant would feel so strongly about it, and I’ve been generally baffled by your very defensive response to what is largely a very positive review! And I’m afraid you’ve lost me with ‘tater takin’! Oh dear. Such a shame when people are so rude about a review (I’m talking about x men) Your review hasn’t put me off, I still want to go. The service is something that can be improved on (if comments like yours are taken on board). Sad that an opinion is blown out of all proportion. It just ends up drawing attention to the bad bits and making it all seem more negative. Thanks for your comment, Nikki. I’m pleased the review didn’t put you off as it wasn’t intended to, and as you say, comments like that draw attention to the negatives in what was otherwise not a bad experience! This was a largely positive review so I’m baffled by X-Men’s quite aggressive response. I also (prompted by this comment) had a quick look at both the guest and management responses on TA, and while I always take the comments there with a healthy pinch of salt, the issues raised are also around service and whether the restaurant is achieving its fine dining aim. It sounds like a more mature approach might be to take genuine feedback on board, accept the positives with grace and work on the rest. Hi Hannah. The food sounds great, we need a Michelin star restaurant in Wales, this does sound more brassiere style however. Your blog is far from pretentious. Surely a blog is to give your honest review? You are constructive in your response to the service issues. Unfortunately I have seen this often, food maybe good but money isn’t put into staff training, and no one pays for experienced staff to lead the team. Just one small comment for Gareth please please try to get rid of the smokers at the front, I would love to have booked here for my fathers 70th birthday but another family member passes often and put us off because of the people congregating at the front.